To commemorate the 100th Anniversary of the 1918 Armistice which ended World War I, the Carlisle Cultural Council is launching a craft project in remembrance of the people who died as a result of WWI. We ask the people of Carlisle to join us on Old Home Day to help knit, crochet and create poppies to honor this significant Anniversary. The poppies will be assembled and displayed together on the Town Center statue at the rotary on November 11, 2018. No experience is necessary - supplies and expert instruction will be provided - all we need is you! The poppy has been adopted as the memorial flower of Veterans of Foreign Wars. You may read Lt Colonel John McCrae's poem below to learn of the significance of the poppy. Plan to join us at the Honor Roll Memorial on the Carlisle Green on Old Home Day, June 23, 2018, starting at 10:30am. On May 2, 1915, Lt Colonel John McCrae’s close friend and former student Alexis Helmer, was killed by a German shell. That evening, in the absence of a Chaplain, John McCrae recited from memory a few passages from the Church of England’s “Order of the Burial of the Dead”. For security reasons Helmer’s burial in Essex Farm Cemetery was performed in complete darkness. The next day, May 3, 1915, Sergeant-Major Cyril Allinson was delivering mail. McCrae was sitting at the back of an ambulance parked near the dressing station beside the YserCanal, just a few hundred yards north of Ypres, Belgium. As John McCrae was writing his In Flanders Fields poem, Allinson silently watched and later recalled, “His face was very tired but calm as he wrote. He looked around from time to time, his eyes straying to Helmer's grave." 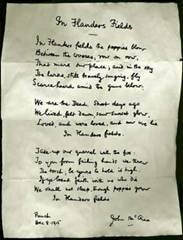 “The (Flanders Fields) poem was an exact description of the scene in front of us both. He used the word blow in that line because the poppies actually were being blown that morning by a gentle east wind. It never occurred to me at that time that it would ever be published. It seemed to me just an exact description of the scene."